Frisco Coachline is an approved vendor for the following school districts: Azle, Burleson, Frisco, Ft Worth, and Sanger. Football games, 5th grade camps, Soccer tournaments and Swimming and band competitions are just some of the trips completed by us for schools in these areas. At Frisco Coachline we understand the needs and requirements of the local school districts and work closely with the Secretaries, Coaches, Band Directors and whomever else books the buses to ensure that we fulfill all their requests to the best of our ability. We are flexible with itinerary changes and are always prepared for the unexpected! Many Private schools in the Dallas/ Ft Worth area have utilized the services of Frisco Coachline to safely transport students to various events. We always assign drivers who are experienced with driving school age children and know what to expect from the different grade levels. Our drivers are safe, polite, professional and approachable. 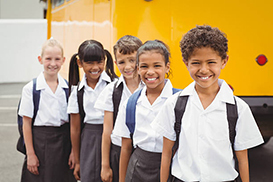 We understand that private schools can have unique guidelines and expectations of their charter bus service and we do our best to gain their trust. Just like with the independent school districts, the service provided by Frisco Coachline has included Charter bus travel to and from sporting competitions, academic decathlons, Band and Cheerleading competitions and much more. Different departments of the schools have required service ranging from hourly rentals to transportation to local camps, as well as statewide and nationwide tournaments. As an extension of the service provided to the Independent school districts Frisco Coachline has also often been called upon by local PTA’s and Booster clubs to charter kids and parents to different Social, academic, sports and Arts events. The comfortable, modern amenities provided in our buses means that we are a popular choice with many word of mouth referrals from satisfied customers. Competitive rates and flexible payment terms makes it easy for these groups to reserve buses with us and also knowing that professionalism and safety are key components to our success here at Frisco Coachline.